Bring some psychedelic fun to your next gathering with Tie-Dye Fruity Cupcakes. 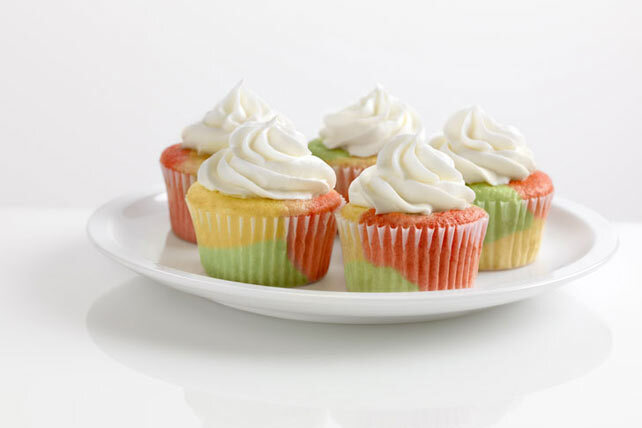 Tie-Dye Fruity Cupcakes are almost as fun to look at as they are to eat. Insert desired decorating tip in pastry bag. Fold down top of pastry bag about halfway, forming a cuff. Spoon enough frosting into bag to fill halfway. Unfold cuffed top and twist bag until it meets level of frosting in bag. To pipe, hold bag firmly and squeeze from top of bag, keeping bag twisted to prevent frosting from leaking out from top of bag. If you don't have a pastry bag, you can use a resealable plastic bag instead. Spoon frosting into bag, then cut piece off one corner of bag. Twist top of bag as directed, then use to pipe frosting onto cupcakes. Combine leftover dry gelatin mixes in medium bowl. Add 1-1/2 cups boiling water; stir 2 min. until mixes are completely dissolved. Stir in 1-1/2 cups cold water. Refrigerate several hours or until firm.